Discussion in 'L Ron Hubbard' started by Chris Shugart, Jul 16, 2018. I've just started a new feature on my FSM site. It's my hare-brained attempt at creating a new internet meme along the lines of Chuck Norris Facts. We'll see how it goes. Here's the first entry. Others will follow. 2) Hubbard never had a second wife, all that was just a slight misunderstanding don't you see. Chris, I see your site makes the claim that Hubbard was the first person to surf the Banzai Pipeline. Of course this is true, since LRH not only mocked up the Banzai Pipeline, but the very Hawaiian Islands themselves, in one of his former lives when he was the Hawaiian god Maui! While this fact isn't generally known, I understand it will be revealed on one of the forthcoming upper OT levels, released on an as-yet-undetermined future date, after enough scngsts have donated for it! I also noticed your site is using some sort of advanced OT numbering scheme, as both the second and third LRH Facts are numbered "2." I realize this can't be an actual error since you're using only !00% standard tech, but it might be out-gradient for those whose reality level isn't high enough to handle it yet. My latest entry might be evidence of work done by someone who has too much time on his hands. You be the judge. 4) In 1928, Hubbard becomes an honorary board member of the Tsingtao Brewery in Shanghai, China. He would soon after become the first American to introduce Chinese beer to the West. Tsingtao, the Beer of Mongolian Bandits! A cleared cannibal makes an upstat reg! Sara Northrop in fifty years or so will be rehabilitated and take her rightful as an eminently significant figure in the development of dianetics. 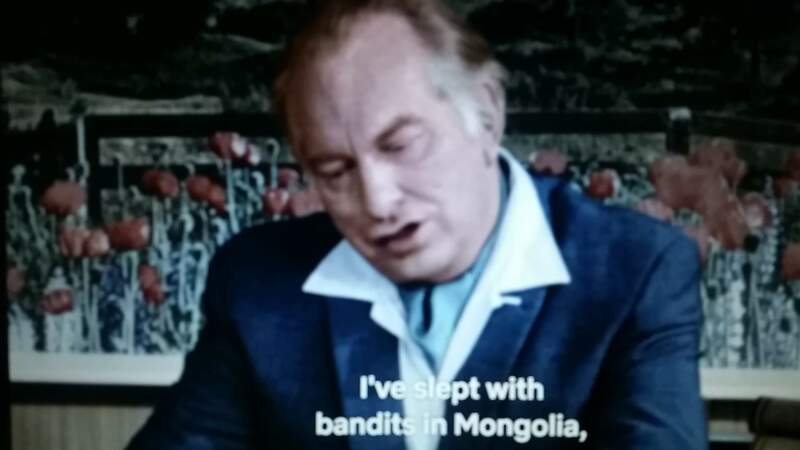 L. Ron Hubbard was a man; for better and for worse in all that means. You and your gang of bandits have been riding furiously across the grassland steppes of the Mongolian Plateau, ransacking small villages all along the way. After a successful day of fruitful plunder, you gather around the campfire with your fellow marauders, exchanging heroic stories of triumph and conquest. From the high peaks of the Khangai Mountains, to the vast reaches of the Gobi Desert, Tsingtao is recognized as Mongolia’s premium beer of choice. So when you knock off for the day, enjoy the hearty full flavor of malt, hops, and rice. Tsingtao beer, the refreshing lager of Mongolian bandits since 1903. Can someone get me the Tsingtao marketing dept? I think I've got a winner here. In before Thur 2 PM! This one may be a little too esoteric. But hey, Hubbard was that kind of amazing guy. 5) After he abandoned his civil engineering studies at George Washington University, L. Ron Hubbard pursued a career in show business. He got his first break writing comedy for Minsky’s Burlesque circuit. Here, he struck up a relationship with stripper Gypsy Rose Lee, who was virtually unknown at the time. He became her manager and also wrote some comedy material that would become part of Rose’s humorous style. With Hubbard’s encouragement and guidance, she eventually ascended to worldwide fame. Don't forget Ron The Philosopher...or maybe you could. L Ron Hubbard Facts #7: In 1967, Stanley Kubrick and Arthur C. Clark used the likeness of L. Ron Hubbard as their model for the star child in the final scene of 2001: A Space Odyssey. Hilarious. Notice the Poppy field in the background. Obviously a litterary illusion. How many Mongolian bandits did LRH blow in poppy fields? What was the brew called? My POV is from a field of Tsingtao, where I am crouched in terror as these Mongolian wankers are stealing our crops and our Tsingtao. Have to flesh it out, but I think we have a series. L. Ron Hubbard's role in the 1954 movie, The Creature From The Black Lagon was perfect for him. It took a minimum of makeup and the dialog was tailor-made for hubbard.